I frequently get emails and messages from parents asking how to pick a school for their gifted child. It’s a scary thing to find out that your child has specific needs and not know how those needs will be met at school. This is as true for parents of kids with extreme ability as it is for parent of kids with disability. Of course, some of our gifted students have both, which complicates it further. Parents often wonder whether they should send their gifted child to independent (“private”) schools, public schools, charter schools, or whether they should homeschool them. While there is no one right answer for every child and every family, there are considerations all families should make when deciding how to choose a school for their gifted child(ren). Before you start looking at specific schools, there is work to be done as a family. You must determine what it is that you’re hoping to find in a school, and it isn’t always about the child’s brain. It may seem worth it to drive long distances to get your child to a terrific school, and it may be, but make sure you consider all of the aspects of this. Are there other siblings who will now spend too much time in a car to be good for their development and happiness? Will this mean that the gifted student is either in transit or at school too much of the day to leave time for unstructured play or enjoyment? Will it mean that it’s hard to get together with friends from school outside of school? Will the added stress of the commute create a burden on the emotional health of the family? Do you live in an area where bad weather may make a reasonable commute unreasonable at certain times of year? It may be worth it, even if the answer to all of these questions is yes, but it’s definitely worth it to consider them. While many independent schools offer scholarships, the fact remains that they are less diverse than a public school. If it is important to you that your child be surrounded by children from a variety of backgrounds, this may be a consideration for you. If you decide to homeschool, it is important to take advantage of the many opportunities that exist to have children interact with lots of other people. To me, this is one of the great advantages of homeschooling: you are unconstrained by the false and ridiculous system that says that if you’re eight, you’re in third grade, and you’re only allowed to be friends with other eight-year-olds. School costs money. Even public and charter schools cost money, as you often pay activities fees and supply fees and contribute to fundraisers, etc. When you have kids in school, it can seem as though you’re just hemorrhaging money all of the time. Generally speaking, however, public and charter schools will be your least expensive option. Homeschooling can be done cheaply, but it is very easy to spend a lot. If you know that you will want to purchase lots of curriculum and supplies, consider the financial burden this will place on the family. There are virtual schools now that offer students the ability to learn from home with the benefit of a teacher with whom the student is connected through Skype or other platform. If you decide to homeschool, there will be a single income in the family. I’m an enormous fan of a parent in the home with kids and believe that the economics make sense, yet I’m also aware that many families are concerned about the finances in being a single-income family. While many independent schools offer scholarships and many charge as little as possible, the fact remains that they are typically your most expensive option. For some families, this is of little concern. For others, having a child in a school with high fees will be a heavy burden. If the school fees are high enough that they cause contention and anxiety, or if they risk the parents’ own retirement savings, or if they mean that other important experiences will be curtailed, serious thought should be given to whether it is worth it. Consider also that at very expensive schools, it’s not just the fees that are a financial consideration. At some schools, students from families with modest incomes may feel excluded or awkward when their classmates come back from Spring Break talking about their ski trip to Vail, while they didn’t go farther than Grandma’s house in the next town. They may feel badly when they don’t have the car other students have. They may not be able to afford the college their peers are going to. This dynamic isn’t inevitable, but it’s something to consider. Finances are far more than the tuition costs. Every school has a socio-economic profile, and children who fall well outside that profile may have more difficulties than they otherwise would. It may be worth the opportunity, and it is important to evaluate that for your own situation. It seems on the surface that independent schools would offer the best curriculum options for gifted students. After all, aren’t they better schools? Not necessarily. There are absolutely fantastic independent schools. I have been to schools where I thought that I would have given my left arm for my children to be able to attend that school. For example, when I worked with teachers at The Latin School in Chicago, I couldn’t get over how amazing it was. I wanted to persuade my husband to move to Chicago so I could teach there. What a school! I’ve felt the same at the University School in Tulsa, Oklahoma, and at other independent schools I’ve visited to work with their teachers. The reality is that public and charter schools are often also amazing. Great educations are available there as well. I have three gifted children, and all of them were educated solely in public school, except for the years I homeschooled them while we lived overseas. Sometimes, parents have found independent and charter schools to be less flexible than public schools. For example, they may be less open to acceleration. They may feel that their curriculum is already challenging, and they may offer no separate programming for gifted students. Public schools may be larger and able to offer more options for the interests of gifted children. They may have more world languages, more AP classes, more organizations, etc. This is not true in all cases, so do your homework on what is offered. The bottom line here is that you cannot assume that any one type of school will always be better than another type. Schools vary on when and if they identify and begin to serve gifted children. It is reasonable for a school to wait until second or third grade to identify gifted students, but high ability students younger than that should be served through differentiated instruction. I’m not giving many hard and fast rules in this article, but here is one: If the school does not identify and serve gifted children, that is a fatal flaw. This goes for public, private, and charter schools. Certified, experienced teachers are a benefit to students. Can you be a great teacher without being certified? Yes. Can you be a certified teacher and yet be horrible at it? Oh, friends, you have no idea what I’ve seen. Overall, though, schools that do not require their teachers to be certified worry me. I was going to write that sometimes teachers are brought in to teach something specific that they know (like engineering) and they may not need to be certified. I changed my mind. It doesn’t matter what you’re teaching: if you’re teaching for an extended period of time (as opposed to a workshop kind of thing), an understanding of pedagogy is essential. Do you have to have a college degree to learn pedagogy? No. I’ve learned far more about pedagogy since leaving college. However, just content knowledge itself is insufficient. Be careful about the qualifications of the teachers in the school. This isn’t just for charter and independent schools. Sometimes public schools have lots of teachers with emergency certifications. I’m not saying this is deal-breaker. I’m saying be aware. 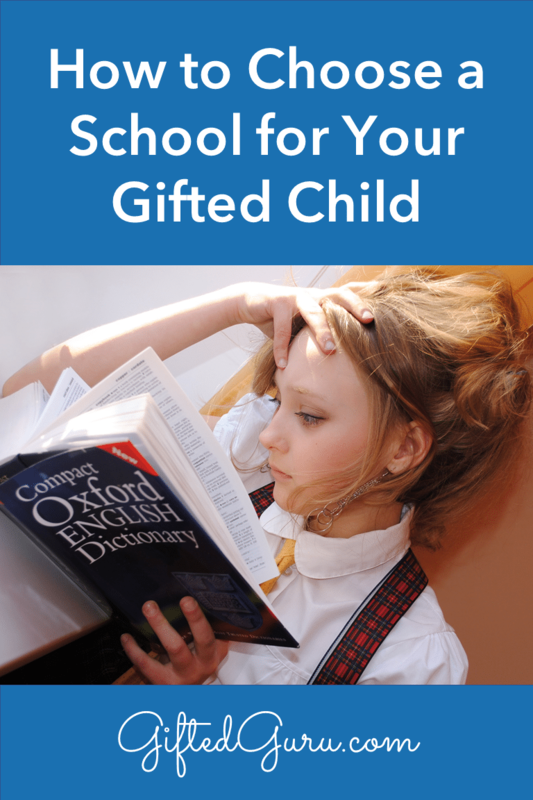 Do the teachers have experience and training in working with gifted children? Shout out to states that require teachers to be trained to serve gifted children. In my opinion, which you can already tell I hate to give, it’s ridiculous that teachers of special education students are required to be certified in that, but those who teach gifted children, whose needs are just as great, are often allowed to teach without any real training at all. Look at NAGC’s list Gifted by State to see what the requirements and services are in your state. Gifted children are not just brains in jars walking around. They have different social and emotional needs than their typical-learner peers. How well do you think the school will meet those needs? One real and present danger is that inexperienced and undertrained educators will misidentify the common traits of gifted students and assume they have ADHD or Autism Spectrum Disorder (ASD) or OCD or ODD or a host of other diagnoses. Gifted often looks like these things when it is not. How the school will handle these needs is perhaps even more important than the curriculum. Children whose social and emotional needs go unmet or ignored will be unlikely to care about the challenging curriculum. The internet is loaded with school ratings. People buy houses based on these ratings. I just sigh and shake my head. School ratings systems are notoriously misleading. You can have truly amazing teachers and a strong curriculum at a very low-performing school. Public schools (and some charters) teach who shows up. That means that there are factors at play beyond what is under the control of the school. It doesn’t mean that your child can’t get a great education there. Frankly, I’ve had the best experience with challenged schools. My children stood out in positive ways and got loads of attention. Were all of our experiences great? Nope. In my own life, my favorite elementary teacher was Mrs. Smallwood at the independent school Pilgrim Lutheran in Santa Monica, California. I don’t know where she is now, but I loved her. My other favorite teachers were in public schools. Ratings tell a story, but they don’t tell the whole story. Go see the school. Let it tell its own story to you. Did you attend a particular school and have a great experience that you want your kids to have? Do you feel a moral obligation to support public schools? What is it important for your children to learn aside from the curriculum? Do you want them at a school that values service and requires it? Do you want them in a school that offers lots of field trips or other experiences? Gifted students often aren’t at school to learn the curriculum. They are often there to learn the soft skills of school: how to work in a group, how to take turns, how to have patience with others. Where will your child best learn those skills? Does your child have a special need that requires a special school? Schools exist for students with dyslexia or other learning disabilities, for students with emotional challenges, and for other specialized services. Do you have a commitment to a certain method of teaching, like Montessori or Waldorf? Keep in mind that these are often elementary-level services only, and your child may have to make a leap to a more traditional school later. Does your child like exploring a single topic deeply? Homeschooling allows for this better than any other option. Do you have a strong faith tradition that offers schooling options? I’m a huge fan of the Classical Christian School model because I’m of the belief that strong foundations in the classics of literature and good thinking help all students. There are many other great faith-based schools available. Does your school district offer a blend of school/homeschool? That may be an option for you. Also, some districts run their own charters, including my neighboring district’s school for the highly gifted. Your gifted child is a whole child. Giftedness is just one aspect of his/her life, so keep in mind that you need a school that serves the whole child. Choosing a school for your child is a challenging task. Take heart in this: I have yet to find a school that wasn’t trying very hard to do what is best and right for its students. The vast, vast majority of teachers believe deeply in their students and their school. If you have a child who is unhappy or in distress, please seek help from a mental health professional with experience in gifted, even if you feel the school is at fault. The cause is of far less concern than the intervention. If you need support as the parent of a gifted child, please consider joining SENG and taking advantage of their training. Be sure to join NAGC and send a message that you care about the education of gifted children in general, not just your own. Whatever decision you make, keep this in mind: nothing that happens in school will be more important than or replace what happens in your home. You, as the parents, have the greatest power in your child’s life. Even if the school experience is less than ideal, your love and devotion will be the key in their long-term happiness. Your establishing a safe, caring, and stable environment is the most important school of all, and it will serve your children all of their lives. “… it’s ridiculous that teachers of special education students are required to be certified in that, but those who teach gifted children, whose needs are just as great, are often allowed to teach without any real training at all.” I could not possibly agree more. I talked with representatives from two of our state’s universities this weekend that feel the same. One of the difficulties is that few universities have professors qualified to teach the courses. It’s a multi-dimensional problem. I like that you mention visiting the school to learn about its story yourself. This would be a great way to meet the teachers and other staff members. When choosing specialized schools to visit, it could help to research online to learn about local options so you can narrow down to your top choices to help you search faster and more efficiently for the right one to teach your child.